The price is amazing. $9.95 for 130 pages in full color? That’s unheard of! It’s excellent quality too, with pages that will hold up to younger hands and being stuffed into a backpack. 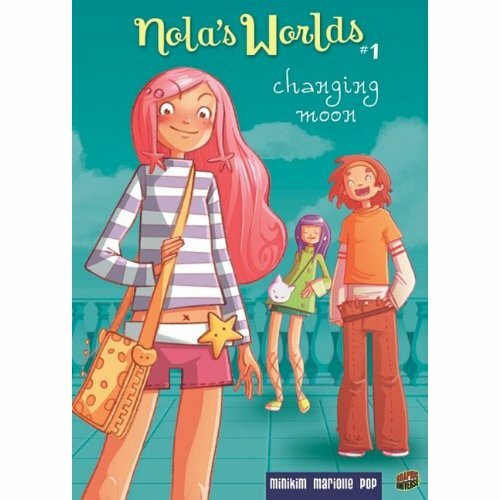 It is a good story to share, but an even better one to read alone, when you can let your own imagination run as wild as Nola’s. The art has a manga edge, but it’s not too much… what makes the book sing are the colours. Incredibly vibrant (in the Magic Trixie vein), just looking at the pages is bound to make readers happy. This is no Nancy Drew. This is no Sabrina. This is a book series aimed at todays’ anime/manga wise market with graphic novel sensibilities. Look for it to get more interesting. Ahaha! Check out Nola’s funny pose! Cute artwork from Nola’s World. Getting clean after a long day of adventuring is important! Check out the awesome button designs! Wouldn’t these look just -adorable- attached to your purse or backpack? Flowers will put a smile on any girl’s face! Our heroes from Nola’s World! An adorably simple piece of art from Nola’s World! Don’t you just want to hug it?